Is there anything better than when a client says to you “We’ve needed you. We’ve been waiting for a… Jennifer!”? It sure has to be in the top five of my list of things that are great to hear. But with that said, what they really meant was that they needed what they didn’t have before they hired me — a critical voice. Generally, I’m more interested in what isn’t working that what is. Looking at what doesn’t work or what you don’t know is the greatest source of learning for most growing teams. Most startup founders are living their life’s passions. They’ve been told that if they don’t believe in themselves no one else will, so much so that they aren’t objective. And that’s okay. Being perfectly honest, the last thing I want is an objective CEO or Founder leading my team. If they table their passion, we’ll really be sunk. We learned from our online dictionary (Thanks Google) that there are a couple types of criticism. That which expresses adverse or disapproving comments or judgments. When expressing or involving an analysis of the merits and faults of a work of literature, music, or art. When a situation or problem has the potential to become disastrous; at a point of crisis. 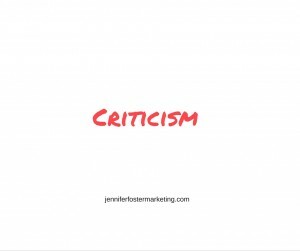 So when and how can criticism be helpful? What I bring to the table, and one of the things I love about being a consultant, is that I don’t know the history. There are no “cherished expectations” or “sacred cows” when you’ve hired me. Anyone you hire from the outside has to be willing to be honest even when it hurts. If I only come in and tell you all your ideas are great — I’ve failed. This is what was going on with my client. I was able to help them push through a complicated decision, because I didn’t know the history. In the particular instance, my client is in a very enviable solution that they have a host of different channels in which to play and be successful. Where my “honest criticism” had to become a valuable factor was that we don’t have the time or the resources to chase them all or to build them all. Putting on my best “To Market” mentality, I help them critique some of the options to see they were less timely and more costly. But what if we repeat our current successes in the two or three industries where we already had victories? We needed to do this because we can do it faster and more importantly CHEAPER. Like all small startups, we’re a small team doing our best to go toe to toe with the big guy competitors, impress a few people enough to become our customers, take care of our current customers and convey and grow opportunities a for financial investment. Working only one one of these becomes a death sentence for the others. Criticism tends to focus on past or immediate actions, but it often pays off in the future by helping avoid pitfalls and landmines associated with risky decisions. So for our team, making sure that we spend our time (let’s even leave money out of this point), in a cohesive and thoughtful manner is key for the next six months. But we’d likely never get there if we never ranked and came to agreement on priorities. When a small company has been in the trenches for months and sometimes years, they can’t objectively look at the work they’ve done and put it aside. In my case we don’t have to abandon the other options, just back-burner them until the resource and timing issues are smaller hurdles. (Let’s face it resource and timing issues never truly resolve completely.) But if you hire a critical partner — especially in a key place like marketing — they can be counted on to help you see the pitfalls. If marketing functions correctly, it can observe all areas including product development, sales, customer service and perhaps compliance or regulation.